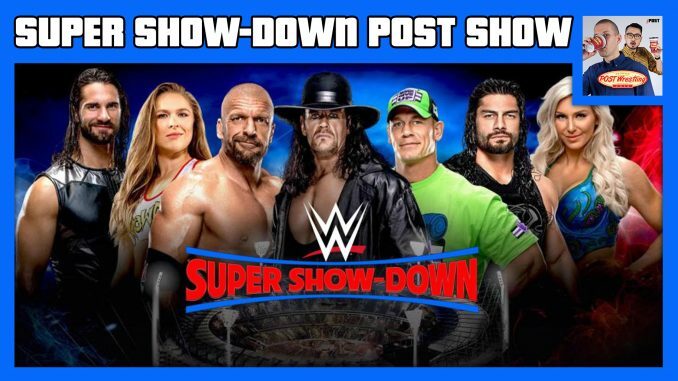 John Pollock & Wai Ting review WWE Super Show-Down from the MCG in Melbourne, Australia. They discuss the main event featuring The Undertaker vs. Triple H, the post-match angle with Shawn Michaels and Kane, AJ Styles defending the WWE title against Samoa Joe, the reaction to Buddy Murphy and his title win over Cedric Alexander, the short match between Daniel Bryan and The Miz, John Cena’s hair, Jimmy Uso’s affair with a meat pie, and a full rundown of the card with live reports from listeners from Melbourne. Double Double, Iced Capp & Espresso patrons can WATCH video of our review by clicking here.